Note - I've tried to include information that affects both indoor and outdoor trains of most scales. I've also tried to point out which approaches work better for which kinds of trains. if I've overlooked something that is especially helpful for your kind of railroading, please contact me, and I'll try to get it into the article. If you have a lot of plastic wheels or - for outdoor railroaders - a nut tree or evergreens overhanging the track, your train's wheels will get outright grungy. Usually the biggest offender is plastic wheels. Since I replaced most of my trains' plastic wheels with metal, I now go about five times longer between locomotive wheel cleanings. Also, several locomotives that other people accuse of poor power pickup work fine for me. In any case, this article will help you get your locomotive picking up power like it used to. And it's a pretty easy task that goes quickly once you're used to it. Grunge from plastic wheels, plant goop, tree sap, etc. Oxidation from arcing. Wherever a spark, no matter how tiny, passes between the track and the wheel, it has the potential to create a microscopic spot of non-conductive oxidation on the surface of the wheel. When your track and wheels are clean, there are very few sparks. But if gunk on the wheel or the track causes power to stop passing between them for even a millisecond, there will be a tiny spark when the connection is made again. So running a train with gunky wheels or track also increases the amount of oxidation. Having More Power Pickup Wheels Helps - Now, the more power pickup wheels you have on your locomotives, the better they will perform with marginally grungy track. Even when you clean the wheels, you may notice relatively little oxidation. But on some 4-wheeled locomotives, you're lucky to have one wheel on each side making good contact with the track at any given time. So any grunge at all starts the oxidation cycle, and before long, you're wondering what's wrong with your locomotive. Cleaning Grunge - Most grunge that accumulates on non-powered wheels will easily dissolve in any weak oil-based solvent such as cheap lamp oil or "Smoke Fluid" (which is pretty much a better version of the same thing). I like to use strips of cotton from old (hopefully clean) t-shirts or whatever. I moisten a corner with the oil, then use that corner to wipe the grunge off of the wheels. The hard part of this may be getting access to the wheels. Non-Drive Wheels - Most outdoor railroaders only clean the wheels on their locomotives, and often only the drivers and any other wheels that pick up power. After all, the car wheels get grungy running in the real world anyway, and dirty car wheels don't affect performance that much. On the other hand, my old American Flyer cars used to pick up so much grunge that it would actually affect the shape of the wheels! Fortunately, first-generation bakelite is no longer in common usage. Nevertheless, you still may need or at least want to clean the wheels on your cars. Sometimes you can snap the non-drive wheels out without damaging anything, wipe them clean, then snap them back into place. This is usually true on cars that have one-piece molded plastic trucks, like most HO cars, as well as some less expensive Large Scale cars. However, on some cars (like AristoCraft's) trying to take the wheels out to clean them may result in truck springs or other things you need shooting across the room and disappearing. 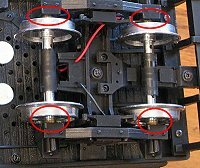 Power Pickup Wheels - Another issue can be posed by power pickup wheels. The AristoCraft tender truck to the left below uses metal axle bearings to pick up power. On these trucks, you don't have to worry about carbon "brushes" and shooting out if you pop out the wheels to wipe them off (although you do need to worry about the little side springs we showed you above. 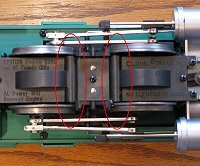 The photo to the right below shows a typical LGB power pickup method - spring-loaded carbon brushes that pick up power from the inside of the metal wheel. If you want to pop these wheels out to clean them, slide a knife blade between the carbon brush and the wheel on one side, then ease the first wheel out gently, so that you are relieving pressure on the assembly near the other wheel slowly. In most cases, if you can relieve pressure slowly on the brushes, they'll stick out an extra quarter of an inch or so, and they will probably fall out if you tilt the car, but they won't shoot across the room. If you relieve pressure on them too quickly, say by snapping the wheel out without thinking, you'll find yourself on your hands and knees with a flashlight in a hurry. 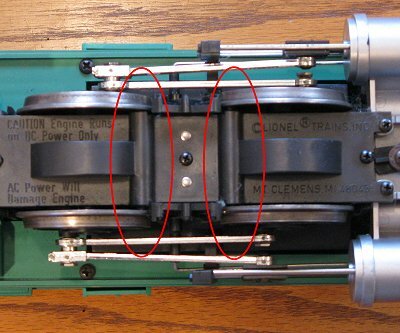 By the way, many locomotive drive wheels convey power to the engine using the same kind of sprung carbon brush assembly as shown to the right above. 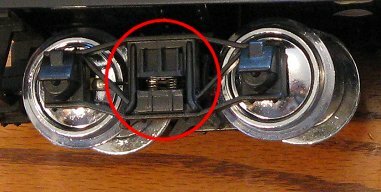 If you ever have to disassemble a locomotive, look for those brushes before you get out the screwdriver, and make certain you have extra springs on hand. Also, if you run equipment like this for a very long time, the brushes (which are really graphite cylinders) will wear out, and sometimes you get the little metal holders rubbing on the wheel rims, producing a chalk-on-the-blackboard sound. Fortunately, replacement carbon brushes are pretty easy to get from manufacturers and many of them are interchangeable. On most locomotives, the drive wheels not only power the train, they also pick up electricity. So when they get gummed up, they really need attention. 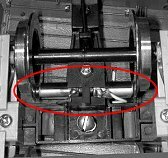 They can't be popped out as easily as non-drive wheels for any number of reasons, including the likelihood of expelling power pickup brushes like the ones hidden under the bottom plate of the old Lionel Large Scale locomotive to the right. (The Thomas, James, D&RGW, and CN locomotives have additional gearing complications as well). 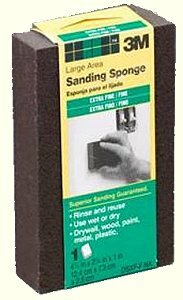 An ultra-fine sanding block or other minimally abrasive sanding solution. Sometimes you can use the styrofoam packing that comes with the locomotive. The photo to the left below shows a Bachmann Anniversary Model Large Scale 10-wheeler sitting in the nice, form-fitting foam packing material it comes with. Most of the time, most model railroaders lay a soft, clean cloth loosely across their legs and hold the locomotive in their lap when they do this. I don't have a photo of me holding a locomotive in my lap because the lens on my camera doesn't go that wide. If you actually have no oxidation on your drive wheels, you can clean them with lamp oil and a clean cotton cloth, just like the other wheels. On many of my smaller locomotives, though, I get enough oxidation that a chemical cleaning alone is not enough. For more aggressive cleaning, some folks use Scotch Brite pads, which aren't really abrasive at all, but do the job, especially if there is minimal oxidation. On the other hand, I usually wait until the locomotive is barely running before I get around to cleaning the wheels, so I usually need something with a little more bite, such as the Scotch sanding sponge shown to the right. I would prefer to get a 100% ultra-fine sponge, but the best I can get is a sponge that's ultra-fine on one side and fine on the other. It so happens that if you use a sanding sponge, you can only use the corners. But since I also use sanding sponges to clean my track, I just "promote" any sanding sponge with all of the corners worn out to that use. Note about Abrasive Wheel-Cleaning Products - Notice that I say "minimally abrasive" above. If you use medium or "coarse" materials to clean your wheels, they'll leave lots of little grooves that will collect gunk extra fast and then you'll be cleaning your wheels twice as often - not to mention wearing away your drivers if you get too aggressive. Once you have a cleaning product, a source of power, and a safe way to hold your locomotive upside down, the easiest way to clean your locomotives wheels is to apply a low amount of power to the locomotives to get the drive wheels turning. Then you just hold the cleaning material up against the wheels. 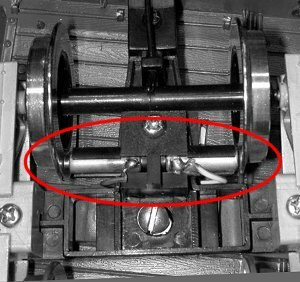 If you have an 0-4-0 or 0-6-0 that only has drivers, the best way is to hold the leads from the power supply on the inside surface of the wheels. You CAN put the wires right on the driver surface, but that can actually increase oxidation just where you don't need it. Once you have the locomotive's wheels turning slowly, hold your cleaning material lightly against each driver as it turns, until all drivers are clean. Don't apply too much pressure all at once - you may overload your locomotive motor. And don't blow any dust or debris off of the wheels while the locomotive is upside-down - in some cases, you'll blow the dust right into the works of the locomotive. Maybe you don't have time to take your locomotive and a power supply inside. 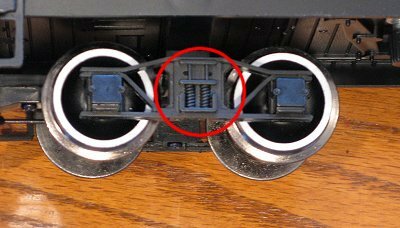 During a recent open house, I cleaned an 0-4-0's wheels in a hurry just by powering the track lightly, I used my sanding sponge to clean off the part of the drivers I could reach, set it on the track to advance a bit farther, cleaned off the next bit, and so on. You cut the brush into two or four pieces, fasten it to a board, bristle-side up, with each pair of brushes 45mm (1 3/4") apart (from center-to-center). Then you strip several inches off of the wire and wind the exposed copper around inside the brush bristles. One wire powers the bristles on one side of the board, and the other wire powers the bristles on the other side of the board. (You can even use solder if you are careful not to melt or ignite the part of the brush that holds the bristles.) Then you fasten the power lines to a DC locomotive power supply, turn the power supply on about a third of the way, and hold the locomotive with its wheels over the bristles. The drivers will clean themselves automatically. This approach has advantages in that it reduces the amount of dust, etc. that can fall into the works of the locomotive, and it's a very fast way to clean your drive wheels, once you have the thingamajig built. One disadvantage might be that , until the edges of the copper bristles are worn a bit, they may cut deeper grooves in the wheel rims than the other methods we've recommended. So go gently. The folks who use this method all of the time don't think it's a significant problem, though. Garden Railroader Ron Wenger has posted a step-by-step article on how to build one of these cleaners on the AristoCraft article page. Ron uses small brass brushes that are used for paint stripping and available in paint departments. 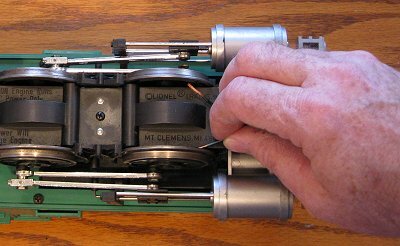 As you can see in his photo, Ron attaches the thingamajig to alligator clips that he can fasten right to the track, which saves him having to use a separate power supply. 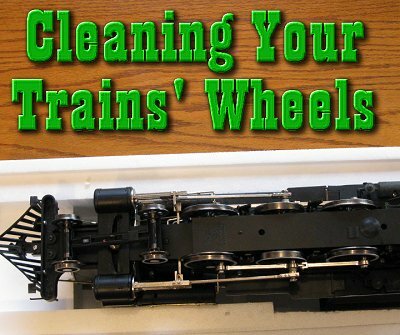 The truth is, wheel cleaning is relatively easy however you do it, and it will give "new life" to your locomotives in a hurry. Most of the materials and methods are either very inexpensive or relatively inexpensive, so you should experiment until you find an approach or combination of approaches that works for you.